Dental implants are fast becoming the treatment of choice for replacing missing or damaged natural teeth. In days gone by it was common for patients to have to deal with removable dentures however today there are better and more comfortable alternatives to removable dentures. Dental implants treatment is changing. Initially the protocol for placing dental implants stated that it was necessary to leave dental implants to heal for a period of 6 months. During this time the dental implant was buried underneath the gum tissue and the patient needed to wait until the bone and implant healed. Today with same day implants it has been proven by scientific studies that one is able to have dental implants in one day. The reason for this is that dental implant designs have changed since the earlier designs of dental implants first available. With dental implants in one day, the dental implant surgery is carried out normally using a more advanced design of dental implant. This dental implant has more agressive cutting threads and the hole prepared for the dental implant is slightly underprepared intentionally. Using dental implants in one day approach the patient is able to benefit from the replacement of dental implants immediately following surgery. This is particularly useful if a patient has lost for example a front tooth due to an accident or trauma. 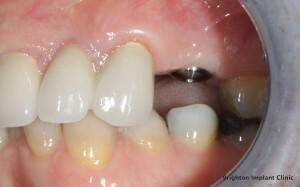 A common time when we used the dental implants in one day approach is during the teeth on 4 procedure. In this surgery a minimum of four dental implants are placed in the upper or lower jaw. On the same day of surgery a fixed dental bridge is loaded onto the dental implants on the same day. Same day teeth for same day smiles ! For more information about dental implants in one day please feel free to Contact Brighton Implant Clinic or Call us on 0800 111 6623. 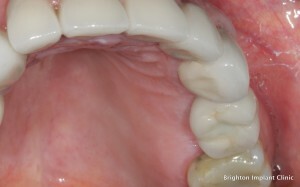 This is fantastic news for people missing one or two teeth, but i would like to know if its possible to have the whole mouth done (over a period of days/weeks) ? Has it already been done to someone and what were the results after a six-month period ? 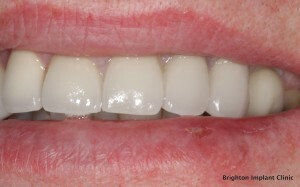 Hi Ed, yes its is possible to replace multiple teeth or even all of the teeth with same day dental implants. This is commonly done. The success rates of implants are over 90% so its a predictable and reliable solution.